Scott, a young financial executive reluctantly agrees to help a friend who claims he’s experiencing a supernatural digestive condition. In the process, he discovers that Krotchfeld Lubitsch Syndrome, a little-known medical condition which causes its victims to regurgitate fully prepared gourmet meals, is spreading around the world. FOODIE is a dark comedy about absurd things happening to ordinary people. It’s about being afraid of the unknown, being afraid of losing control and then conquering those fears. But most of all, FOODIE is about laughing at one’s own anxieties. 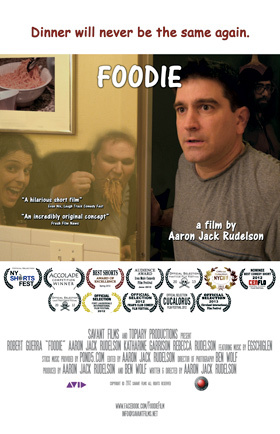 FOODIE is the fourth film by writer/director Aaron Rudelson and it has screened in nearly a dozen festivals across the country, from Florida and North Carolina to Colorado, Ohio and New York. It has received awards and accolades from festivals and online publications such as Film Threat and Fresh Film News among others.